An acoustic guitar has normally heavier strings than an electric guitar because you want a loud and rich sound. With an electric guitar you don’t need that much volume because you can adjust the sound easily with the amp. Consequently playing the acoustic requires more strength and finger pressure, and some techniques like string bending are much more difficult or – e.g. on the wound g string – not really possible. At home I normally play acoustic guitars the way they are supposed to, fingerpicking or strumming with heavy string. For that lead stuff I take an electric guitar which I often play without amp at home. While this is loud enough for practicing in most situations , it surely wouldn’t hurt if it was louder, like an ‘acoustic’ electric guitar so to say (I have friends who favour semi-acoustics like the Gibson 335 for this reason). One day I found another, even better solution: I took an acoustic and simply put really light strings on it. This way I can play it like an electric guitar. One the other hand, the warm sound of a an acoustic has also to do with the different kind of strings used on them – normally bronze or phosphor wound. And these are not available in thin, electric-guitar like gauges of course. No problem, I take a normal set for acoustic guitar (like a 012 – 056) but I use a thin 09 string for the high e-string (the unwound strings are the same material for electric and acoustic guitars anyway). Then I use the e-string of that set for the b-string, the b-strings for the g-string, and so on. The low e-string is left over. So, if your set is e.g. 12, 16, 22w, 32, 42, 56, this will result in 09, 012, 16, 22w, 32, 42 – pretty much a standard gauge for electric guitars but in bronze or phosphor-bronze. I recommend to relief the truss-rod of that guitar a bit to match the lower string tension. The Martin DXK2 I use for this purpose (a rather cheap Martin model) sounds of course different than it did before but still sounds great for all kind of stuff and plays like an electric, great for practicing. Something to try out – I love it. 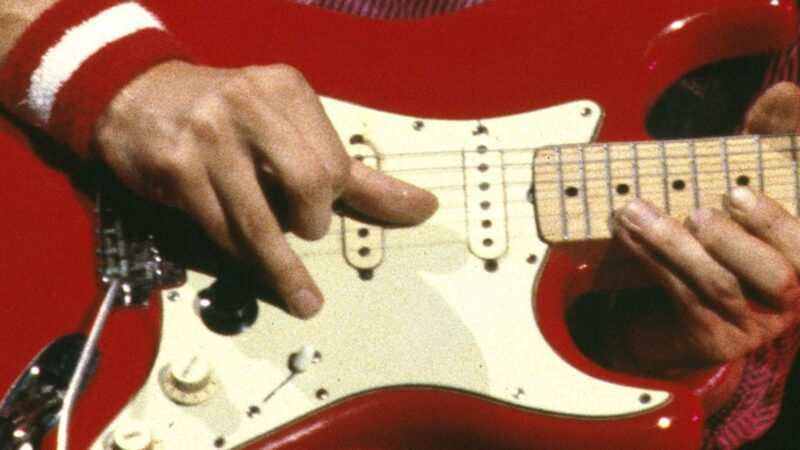 ⟵How to get that Sultans of Swing Sound – Mark Knopfler played 08 strings?